California is a huge state that has many things to offer. From expansive deserts landscapes, major cities with seemingly endless cuisines to tiny coastal towns surrounded by towering redwoods, the hardest part is knowing where to start exploring and not be overwhelmed by the array of choices in the best way possible. Enter the complete California bucket list with 30 must-see sights that will hopefully help you create your very own Golden State itinerary. From adorable sea otters, to over 30,000 other sea creatures, this impressive aquarium is a great spot to spend half a day learn about surrounding ocean life and the importance of conservation issues that the museum focuses on. This national park needs no introduction, with its dramatic cliffs and sweeping valley floor. The best way to explore Yosemite is by going on a hike or two, preferably featuring a few waterfalls. Travel tip: try to stay in the actual park for easy access to the trails. There is nothing better than breathing in that crisp mountain air, whether you visit during summer or winter or anywhere in between. As a rare California destination that gets snow, it’s an excellent spot to spend a day on the slopes. These two wine towns are both worth visiting, each with their own character. Napa feels a bit more upscale and worldly, while Sonoma (a personal favorite) is more community-driven with a central town square and a small town feel. 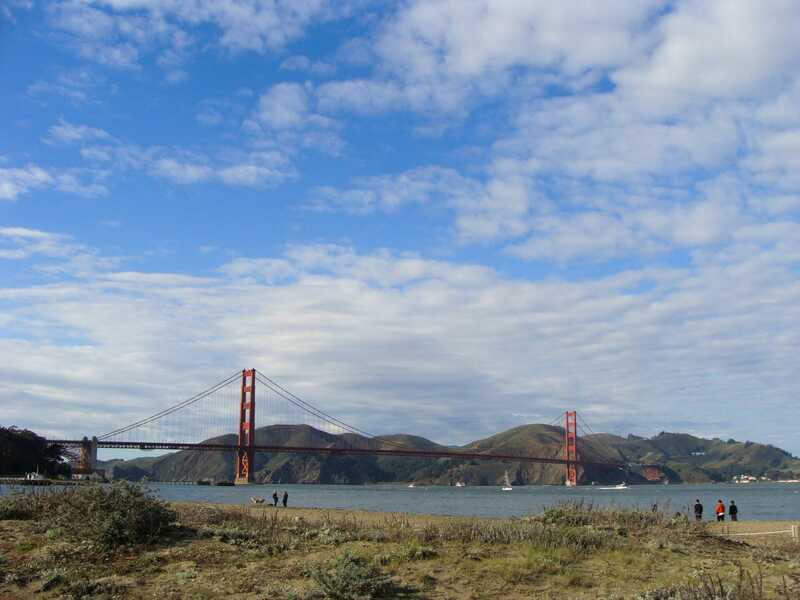 There are many ways to see San Francisco’s most iconic landmark. Hiking along Lands End, you are treated to a breathtaking view of the bridge with the Pacific Ocean. Walking on Crissy Field, the bridge becomes a backdrop with the bay. You can also get up close and personal at Fort Point, which is located at the foot of the bridge. The Golden Gate Bridge should definitely be included on your California bucket list. Located in the northern town of Fort Bragg, this beach is defined by colorful glass that was created when this spot was a dump and people would dispose their glass bottles here. This is one of the best examples of turning someone else’s trash into a natural treasure. As the largest rotating tram in the world, this scenic ride takes you to the top of the San Jacinto Peak from Coachella Valley. The tram starts in a desert climate and ends 8, 516 feet above sea level in an alpine forest. At the top enjoy the views while wandering along the numerous nature trails. California has its fair share of scenic coastlines, but this one is hard to beat. With rugged cliffs dropping off into the ocean as you wind your way down the coastline, this area of California never gets old. This historical beach town that features the famous Hotel Del Coronado is worth taking a day trip from San Diego across the Coronado Bridge or on the ferry. Rent a bike and explore the spacious streets and historical homes. This Danish town feels like falling into a Hans Christian Andersen’s fairytale, complete with windmills and quaint bakeries selling butter cookies. Rumor has it that Danish immigrants moved to Solvang to escape the freezing winters of the Midwest. A quirky hotel that’s located in the college town of San Luis Obispo on California’s Central Coast, boasts a different theme for each of its 110 rooms. The main building with its formal pink dinning room and waterfall urinal are not to be missed. This scenic stretch of road features towering redwoods trees on either side and is part of the expansive Humboldt State Park. Stop at the small towns along the way for picnic supplies, and then jump in the Eel River for a refreshing afternoon dip. Sacramento is steeped in history and this elegant capitol building is a great place to start. Take a guided tour of the hallowed hallows and if you’re lucky you can catch state legislators at work from the assembly hall on the second floor. There are many stunning beaches located along Malibu’s coast, but this one is a favorite among locals and visitors for its easy access and golden sand beaches. Bring some takeout from Malibu Seafood for a seaside picnic. A stunning estate that was built by California architect Julia Morgan for William Randolph Hearst, Hearst Castle is a must visit when on the Central Coast. Known as a getaway during the 1920s and 30s for Hollywood elite, stars like Greta Garbo and Clark Gable were known to make frequent guest appearances. There are quite a few ghost towns around California, but this state park is one of the best preserved. There are some buildings that are left just as they were when the residents deserted the town after the gold rush died down. Some of the largest trees in the world call this park their home and it’s magical just to be in the presence of these giants. Make sure to check out the tallest one of them all: General Sherman, who measures over 36 feet. With doors that lead to nowhere and reported hauntings throughout the halls, this bizarre residence built by Sarah Winchester is worth stopping by in San Jose. For those who want to take it up a notch, go on a night tour or stop by on Halloween. Know as the largest sundial in the world, this bridge located in Redding is truly an architectural masterpiece. It boasts views of the Sacramento River and the walkway is made completely out of glass. Though this famed road is often referred to as California’s Highway 1 starting in Northern California, the official PCH from Oxnard to Dana Point is a worthwhile abbreviated version to do if you’re short on time. Notable stops include Laguna Beach, Newport Beach, and Long Beach. One of the great desert landscapes of the state, this state park is an ideal spot to explore one of California’s most beautiful landscapes. Joshua Tree is named after the cartoonish trees that looked like they could be straight out of a Dr. Seuss picture book. You may have seen the well-known bumper stickers for this beloved Santa Cruz attraction on cars, especially in Northern California. Book a tour in advance and learn about the mysterious gravitational pull that seems to take over when you enter the area. This classic amusement park beats all the other amusement parks in this state by a mile. The attention to detail is incredible in Disneyland, and it feels like you are truly entering a different world no matter what age you are. Word to the wise: holiday times and summertime are not for the crowd adverse. Located around 22 miles southeast of Los Angeles, this scenic island getaway provides a little something for everyone whether you want to have a spa day or fill your time with outdoor adventures. For one of the best views of Los Angeles, take a quick hike up to the Griffith Observatory and witness how truly expansive this city is. Wander around the hiking trails to different observation points and make sure to get a classic photo of the Hollywood Sign in the backdrop. A unique national park that offers a combination of natural wanders including caves for exploring. One of the popular trails is the Bear Gulch Trail, where you can hike through the caves and it feels like you’re transported to another world. Located in Northeastern corner of the state, Lassen is worth visiting for its volcanic activity, including the popular hydrothermal sites like Bumpass Hell, and charred lava rocks left over from the last eruption. There is nothing better than taking the ferry over to this island off of Newport Beach and wandering around the luxurious waterfront homes and charming storefronts. Don’t forget to get a frozen banana from Sugar ‘n Spice. Home to over 3,700 animals, this zoo focuses on conservation and was one of the first to create open-air exhibits to recreate an animal’s natural habitat. It’s easy to spend a day here wandering around the various areas and learning about the beasts within. California is a relatively young state, but part of its rich history includes the Gold Rush and the small towns along Highway 49, including Sutter Creek. Walking down Main Street you can easily imagine what life was like back in the day. Make sure to stop by the Amador County Museum in neighboring Jackson to learn about local life. What would be on your California bucket list?